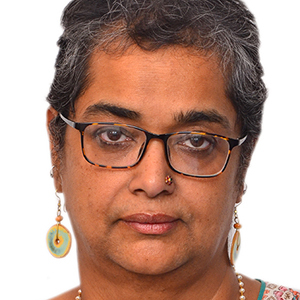 Pramada Menon is a queer feminist activist who has been actively involved in the social justice and women’s human rights sector in India and internationally for more than two decades. She is the Co-founder of CREA and worked there as Director Programs from 2000 till 2008. Prior to that she was with the Dastkar, an organization working for the promotion of crafts and crafts people, as Executive Director. Since 2008, she has been working as an independent consultant with a variety of organizations on issues of women’s human rights, gender and sexuality, organizational change management and professional coaching. Pramada is also a stand up performance artist. She has traveled with her show Fat, Feminist and Free to various cities. In 2013, she directed her first documentary film: ‘And you thought you knew me,’ a film that explores the lives of five people, who were assigned female gender at birth and their interactions with sexuality, queer activism, gender and Delhi.